Deze keer is de challenge op de blog van Guylou's Inimitability: Maak een kaart met de kleur rood. Hiervoor hebben we een digitale afbeelding gekregen genaamd 'Cupid'. Ik vind haar bijzonder stoer! Op de blog van Guylou kun je alle voorbeelden zien van het DT en de winnaar van de vorige challenge is bekend gemaakt. hej, die is gaaf zeg !! Gaaf kaartje, Car! Mooi papier!!! 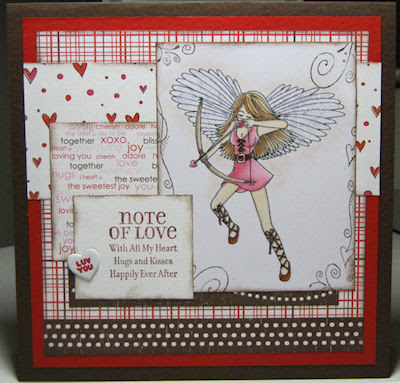 Love, Love, Love your card!!! This is gorgeous!!! Did you doodle around the image... very nice touch!!! Marvelous work!! I love this card Carmen. I really like all the different papers that you put together! Carmen, love it. I love that red plaid card with the polka dot paper and the heart paper, oh and of course the words paper!! Great design. Love the doodling or stamping around the edges of the image!! Great job coloring her!! Gorgeous Card!!! As always I love your paper mix! Love all the detail... especially the doodling around the image.. Really makes her pop! Well done girl! fantastic card. Love the layering and your design. Great job on the challenge! Your coloring + that paper(!!) = FABULOUS!! This card is fantastic! The wonderful swirls with hearts that you have your image printed on...the sentiment...and the fabulous dp...all work together to showcase G's beautiful image. Thanks for sharing.